This guitar wiring is for those of you, who like to using a guitar on-board tone control in many ways, even for very subtle differences. It's based on one volume potentiometer, two tone pots and two capacitors. How this strange tone control works? All tone pots should have 250k. It's because of their connections type - they are in "one line", so sometimes they can act almost like one 500k pot. Higher values of these potentiometers can make the tone control circuit a little inaccurate. If one capacitor have 0,022uF and other have 0,01uF , I will be able to shaping the signal in very non-linear way - there will be two different, working together filters. If I turn the first tone pot to 50% , I will get tone, where some portion of signal will be shaped by two tone caps. When I will turn the tone-balance pot to 70% (closer to 0,01uF cap), some small portion of treble-middle and some bigger portion of high treble signal will be dumped. 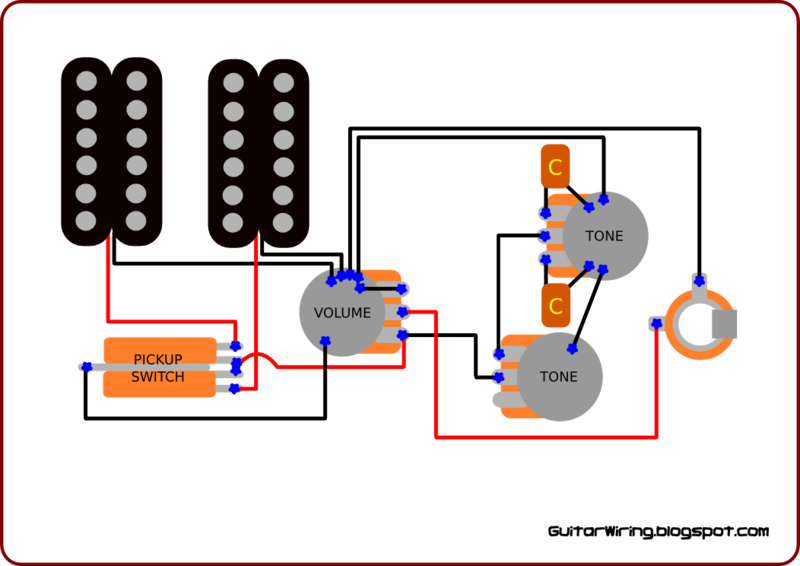 With this tuning, guitar tone will be much more smooth, but not so dull - like with a typical guitar tone control wiring.